The end of September typically marks that magical time of year when Chad and I find ourselves with some mad-money. Last year, we spent all of the moola on house projects and our big housewarming party. This year, we intend to make a big dent in the budget with more house projects and a couple of fun field trips. I've been researching projects, scheduling meetings, budgeting and generally organizing. 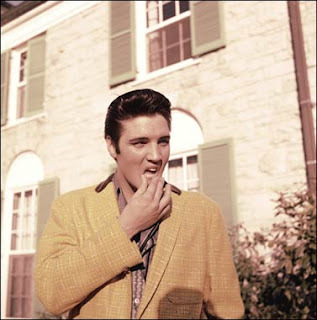 Like Elvis (Presley, not Costello) was fond of saying, "taking care of business, Baby, TCB." My husband ,Chad, kind of looks like young, hot Elvis. Chad also does the lip-grab gesture that Elvis is doing in this photo. Uncanny. • Hired electrician to install three outdoor power outlets. Paul Moreno from Fox Services did a great job and completed the work in one day! • Took a trip to Lowe's to research and price supplies for outdoor lighting for the front of our house and had aforementioned electrical prep work done. • Talked to a helpful Lowe's employee about having one new exterior door and four new interior doors installed. • Scheduled and met with the "door project" contractor. • Priced and chose all door hardware. • Found a local shop that will make a new framed mirror for the bathroom. • Discussed where we want more trees planted in the back yard and chose a nursery to plant the baby trees. • Reserved ski boat and driver for a fun lake day! Wooo-hooo! Pray that I don't break a leg while trying to remember how to slalom. Should be like riding a bike, right? You never forget how to do it? • Begged out of working on New Year's Eve this year. After acting in Murder Mystery Player shows or dealing black-jack for charity events for the past eight years at other people's New Year's Eve festivities, I'm ready to just attend a party this year. Chad has been busily (obsessively) researching his new flat screen TV purchase. Presently we're still kickin' it old school with a boxy TV. Of course, getting the High Definition flat screen TV means that we have to get a new DVD player, replace a few beloved movies that we had on VHS tape with DVDs, sign up for High Definition cable and figure out how to wall mount the new TV. I'm so thankful to have a generous husband who works very hard to give us a nice house and a comfortable lifestyle. However, there are certain moments when I pine for the simpler, less materialistic days as the renter of a 650 square-foot apartment that had all bills paid and no storage space for extraneous possessions. In the future, if you hear me talking about wanting a bigger house or more materialistic stuff, please thrust a well-worn copy of Henry David Thoreau's Walden into my greedy, well-manicured hands. Then hope that I don't smack you on the forehead with the book. Make sure it's a paperback copy. 1. Soccer Mom - my blond flip wig worn with a grey sweater set, pearls, khaki pants or "mom jeans". I'll carry a soccer ball, wear my phone on a hip holster with the hands-free cord in my ear, and my car keys on a cord around my neck. 2. Ugly Betty - I LOVE this TV show and its titular character. 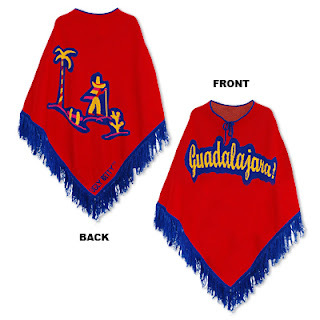 I can buy Betty's poncho online, which is kind of a cop-out in the creativity department. I have the wig and fake glasses somewhere in the costume box. I need to search online for fake braces for my teeth. 3. 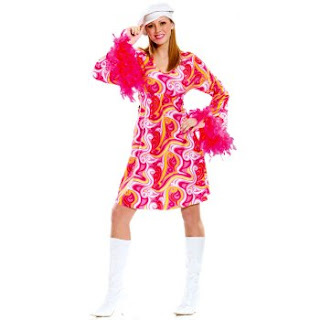 1960s psychedelic hipster - again the blond flip wig with too much eyeliner, frosty lipstick and a swirly, trippy printed dress somewhere between Goldie Hawn circa Laugh-In and Mrs. Roper from Three's Company. The cutest costume I've seen in the past ten years was when my friend, Jenny, dressed up as Harry Potter with Hedwig the owl on her shoulder. She had short hair, painted on the scar, wore the glasses, school robe and necktie. It totally worked. My second favorite costume was when Chad dressed as PeeWee Herman! Submit your ideas or vote on what I should wear by emailing me or commenting here. Wooo... Whoever formulated this test is certifiably insane, high on crack or just plain mean! After answering 105 questions, I read over my exciting career recommendations. My #1 match for a career was (drum roll, please) manufacturing! Below is the sample of possible dream jobs for yours-truly in manufacturing. This info was followed by an advertisement for "National Heavy Equipment Operator School." Wow! I do like to sew and plant things in the yard, thus I must confess that I like to work with my hands, but manufacturing as a career? Um, no. Getting warmer. Lots of experience in these areas including retail management, communications / advertising technician at a major insurance company and marketing for a big, local theatre. I like to paint and draw. I've often said that if I win the lottery, I'll go back to school and take more art classes. I'd be an unpopular artist though, because I like to make things look pretty and I have a low tolerance for high-concept art that needs a lot of explanation (a.k.a. self-indulgent tripe.) My attitude is that a particular artwork either speaks to you or doesn't. If the art speaks to you then you decide if you want it in your house or you don't. Mine is not lofty reasoning, but it works. Try it the next time you're at an art museum or gallery. The website offered the grim advisement: "Employment of actors, producers, and directors is expected to grow on par with all other occupations through 2014. Although a growing number of people will aspire to enter these professions, many will leave the field early because the work—when it is available—is hard, the hours are long, and the pay is inconsistent. Competition for jobs will be stiff, in part because the large number of highly trained and talented actors auditioning for roles generally exceeds the number of parts that become available. Only performers with the most stamina and talent will find regular employment." Very oddly, the advertisement for this section was for "The ABC Dog Obedience Instructor Program is structured to offer you the convenience and cost of a Home Study program with the added benefit of working one on one with some of the most talented trainers in the industry." Chad and I just returned from five fun days in Vancouver. The city and surrounding areas are beautiful with tall trees, a backdrop of mountains and little harbors and inlets all over the place. The weather averaged 72F during the day and 55F at night -- a welcome respite even from this mild Austin summer. The British Columbia residents are incredibly polite and friendly. We stopped in the local Urban Outfitters store to buy a light jacket for Chad, and the lovely lady behind the counter asked us how our day was going and wished us well, which is never likely to happen at an American location of Urban Outfitters, where you're more likely to be sneered at and tolerated during any transaction. A bus driver let us on the bus for FREE when we didn't have the exact fare, saying, "Hey, we're friends. Hop on and you can pay at the transport station when you catch the ferry back across." Wow. I'm inspired to be even nicer than usual. Pass it on, and all that. For those foodies out there, we had great meals the whole time we were in Vancouver. My favorite two spots for atmosphere (because I'm all about the ambiance and less about the chow) were: Glowbal and Brix, both in the Yaletown neighborhood with lovely patios and twinkling lights. Chad really loved Tojo's sushi restaurant. Tojo's had a vegetarian omikase (which means the chef picks your meal and brings out different courses like a tasting menu) so I was in luck. The veggie meal was good, but honestly, this place is quite expensive, spare in decor / atmosphere and not really worth the price unless you're a major sushi fan. Chad is a major sushi fan, so he loved it. Tojo's restaurant was featured in the book (and also on the TV show) 1000 Places to See Before You Die. When I go back to Vancouver, I hope that Chad and I can stay at the Wickaninnish Inn for even more nature exposure and more of a retreat feel; rather than spending so much time downtown like we did on this trip. Overall, this was a wonderful vacation! I can't wait to go back to Vancouver. There is an episode of The Simpsons that features a helper monkey. Come to think of it, there is also an episode of Malcolm in the Middle that features a helper monkey. In both shows, the poor monkeys get corrupted, disgruntled and develop all sorts of bad habits and reproachable behaviors. At our house, we have helper kitties. They help make the guest bed. Hope you're not allergic to cats if you're sleeping over here, because you know they left fur on those fresh sheets. The kitties also help me wrap birthday gifts for Chad. Sonic liked the wrapping job so much, that he tried to eat one of the presents. Marigold is far more civilized and only eats the ribbon. She knows that eating the paper is way gauche. Yep. Little beasties live in our house. We like them.